This weekend cycling holiday to Varese in Northern Italian Lakes will let you the experience of these lakes and mountains by bike. Varese is a pleasant hillside town located in Lombardy, close to Piedmont and to Switzerland, in the foothills of the Swiss-Italian Pre-Alps, a 10-minute ride from Milan Malpensa airport. In just a few days you can see the best views and the hidden gems that our region has to offer from Lake Maggiore to Lake Lugano. Non-riding partners are welcomed along to share the experience with you. Varese is very well-known for amatour cycling, having organised the UCI Gran Fondo World Championships in 2018 and it also hosts the annual UCI Gran Fondo World Series Tre Valli Varesine in October. The race course winds up and down among the Lakes of Lugano, Maggiore and Varese with some tough climbs in between. Learn more about UCI road bicycle races in Northern Italian Lakes. The Shrine of Madonna del Ghisallo at Magreglio. 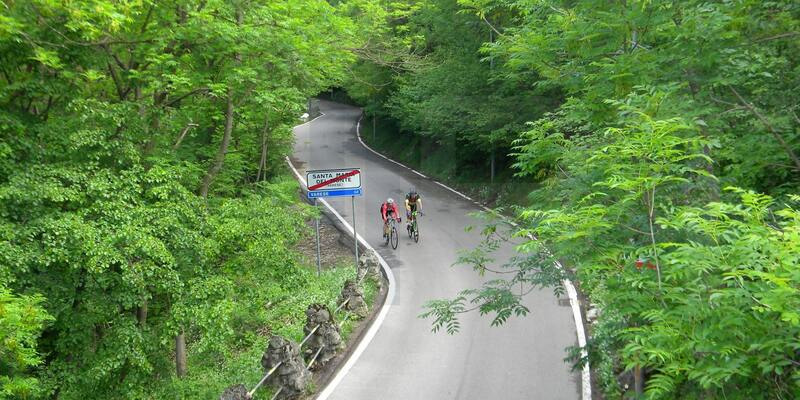 between the two branches of Lake Como, is a must for every cyclist. It's a one-day ride from Varese. You can ride through wooded valleys, narrow climbs, fast descends without forgetting to enjoy what our area has to offer: ancient villas, parks, churches and hermitages which were built from Sixteenth Century to the Nineteenth Century, exibitions, history, art, culture. In particular we suggest to visit Villa della Porta Bozzolo at Casalzuigno, Hermitage of Santa Caterina del Sasso on Lake Maggiore and Sacro Monte of Varese (historic site on the UNESCO Worldwide Heritage List). Learn more about the best tourist attractions around. Each day there are two or more ride options available each varying in distance and difficulty. Anyway the description is a draft. This is a general program to to demonstrate how your cycling holiday is structured. If you would prefer your rides include more distance, less distance or different climbs then please contact us, we are willing to provide you with rides that meets all your needs. We can change places, distances and climbs if all the people on the same tour agree. Please note that all routes are subject to change depending on local conditions. The route in the Southern region of Varese is winding, with lots of ups and downs, through a number of small villages and through the gently rolling hillsides, among Lake Varese, Lake Comabbio, Lake Monate and Lake Maggiore. 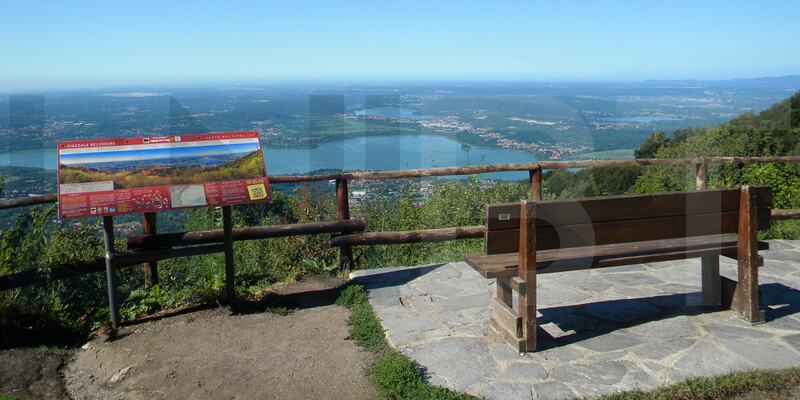 You can see the panoramic view from Azzate and then you reach Angera, a medieval town on the shores of Lake Maggiore. You tackle the Sasso di Gavirate climb and, if you want, the extra Monte Campo dei Fiori climb in the challenging route. From the summit of Monte Campo dei Fiori you can enjoy a wide view of the Alps and of Monte Rosa on one side and flatland on the other where you can see Lake Monate, Lake Comabbio and Lake Maggiore in the distance. Let's get started on our exploration of the foothills to the North of Varese. The ride is undulating with only one slightly difficult climb starting from village of Brusimpiano on Lake Lugano: the Ardena climb. You ride cross three valleys: Valcuvia, Valganna, Valmarchirolo and along five lakes: Lake Maggiore, Lake Lugano, Lake Brinzio, Lake Ganna and Lake Ghirla. Along the route is located Villa Della Porta Bozzolo at Casalzuigno. If you want you can tackle the extra Marzio climb in the challenging route. Today's ride has one focus: go up to the Shrine of Madonna del Ghisallo. The small Chapel is located at Magreglio (CO) between the two branches of Lake Como. It's venerated by international cycling as patroness of cycling and the place has become the focus of many riders' pilgrimages. You cross the Swiss pre-alpine mountains and you ride along Lake Lugano and Lake Como’s shores, passing through the lake side villages of Menaggio and Bellagio where the Madonna del Ghisallo climb starts. We come back to hotel all together by support vehicle. This route ( the short race course) can give you a feel for the race course of UCI Gran Fondo World Series Tre Valli Varesine which has taken place every year in Autumn. Of course you avoid the busier and boring roads for enjoing the most beautiful sections of the short race course. The route is winding, among the Lake Lugano, Lake Maggiore and Lake Varese. You have to to tackle three climbs of the short race course: Alpe Tedesco, Ardena, and Brinzio, and two other climbs for connecting the sections of the route: Roggiano and Sasso di Gavirate. 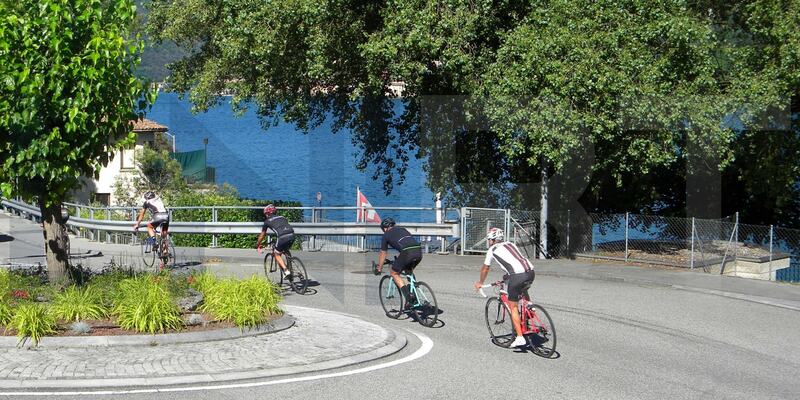 The route is a mostly flat ride around the Lake Lugano, almost completely in Switzerland. You cross the Valceresio Valley, and then the ride unwinds along Lake Lugano, with views and landscapes of Morcote, of Monte Generoso and of Monte Lema in Switzerland. Morcote lies ten kilometers south of Lugano. It is famous for the arcade buildings on the shores of the lake, some of which were constructed in the late Middle Ages. You may meet pro cyclists training in this area. In the main route you can tackle the Arogno climb. If you seek extra kilometres you can climb up Sighignola climb.